We are all deeply shocked and worried about the safety and wellbeing of our beloved son and brother, Jagtar Singh Johal. Our world was completely turned upside down when we received the call about Jagtar’s abduction and detention by the Indian police. His two brothers immediately travelled to India to inquire and clarify any misunderstandings, in turn they along with other family members including Jagtar’s wife faced harassment and intimidation by the same police force. 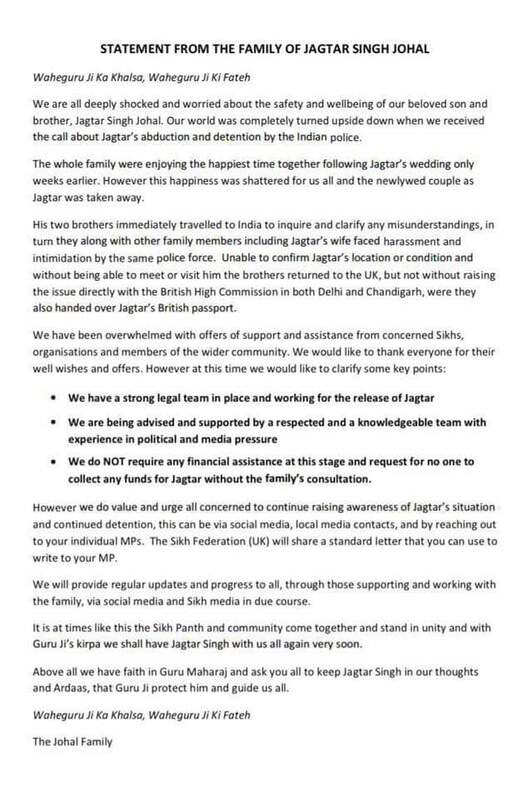 Unable to confirm Jagtar’s location or condition and without being able to meet or visit him the brothers returned to the UK, but not without raising the issue directly with the British High Commission in both Delhi and Chandigarh, were they also handed over Jagtar’s British passport. We have been overwhelmed with offers of support and assistance from concerned Sikhs, organisations and members of the wider community. We would like to thank everyone for their well wishes and offers. Above all we have faith in Guru Maharaj and ask you all to keep Jagtar Singh in our thoughts and Ardaas, that Guru Ji protect him and guide us all.